Here my friends is my new favourite vegetarian lasagne recipe that actually came about by accident. I had a few things in the fridge I needed to use up, some fresh tomatoes, a stack of greens and some left over fresh ricotta. I initially thought of making Cannelloni, but the thought of piping mixture into tubes was a bit much, especially with the short amount of time I had. 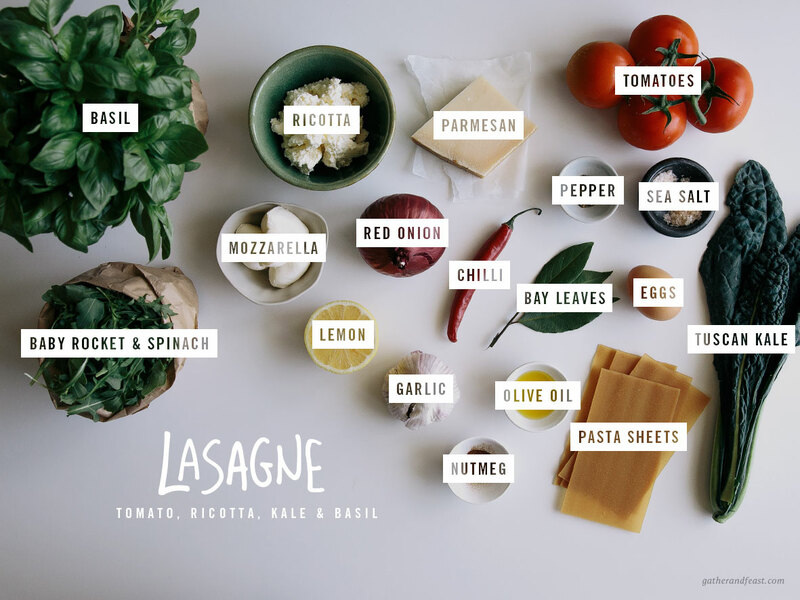 Lasagne was my next best (time efficient) option, and to my surprise resulted in this amazing pasta recipe, a new favourite in my home. The fresh tomato taste, with chili and lemon is a lovely contrast to the rich ricotta and earthy peppery greens. Once all the ingredients are prepared, the final assembly happens quite quickly. I’ve uploaded a few assembly process photos for reference, but feel free to leave a comment below if you have any questions. I hope you LOVE this new recipe as much as I do! Finely chop the onion and garlic and sauté in a pan until soft. Whiz the tomatoes in a blender or food processor until finely chopped. I use my NutriBullet which is quick and easy! Pour the whizzed tomatoes into the pan with the onion and garlic. Then add the lemon zest, chilli flakes, bay leaves, and half of the basil. Simmer the sauce for 20-30 minutes then remove the bay leaves and discard. While the sauce is simmering, sauté the spinach, rocket and shredded kale in a pan with a little olive oil until wilted, then remove from the heat and set aside. In a medium mixing bowl add the ricotta, parmesan, eggs, nutmeg, some salt and pepper, and mix with a fork to combine. Add the wilted spinach, rocket and kale to the ricotta mixture and stir to combine. Now for the fun part! Using a large baking dish, spread some of the tomato sauce onto the bottom of the dish, add one layer of pasta sheets then spread a layer of the greens and ricotta mix, some basil leaves and another layer of pasta sheets. Repeat until all the ingredients have been used up. Place mozzarella slices and basil on top, drizzle with olive oil and sprinkle with sea salt and freshly cracked pepper. Place the baking dish into your pre-heated oven and cook for 50 minutes. Once cooked, remove from the oven and serve with a fresh garden salad. Delish! I’m using some sweet, earthy, autumnal flavours for this super delicious baked oatmeal recipe! The smell of butter, chocolate and spices used to always fill our house in the lead up to Christmas.